CJ Chanco is a freelance writer, photographer, and research officer at the College Editors Guild of the Philippines. In late January, he joined volunteer doctors from Balsa and Samahang Operasyong Sagip as they made their way across Tacloban city and neighbouring barrios in a five-day relief caravan. Everything seems frozen in place. Every tree, branch, every root sticking out from the ground, stretches out toward an unseen horizon as though reaching for a sun that will never come, or shine as bright as it once did. The trees are twisted out of true, like the bodies in the bags that used to occupy nearly every intersection of Tacloban city, the ones the disaster’s first responders would have seen as they passed along the way here (and would have seen, in their half-decomposed state, weeks after the storm). Rows of coconut stand eerily in place, their graceful swaying brought to an abrupt halt by gale-force winds that have forced their fronds to face permanently East – or is it West? It’s impossible to say. The wind had come from every possible direction, shifting as it did with the walls of saltwater that came with broken logs and torn roofs of corrugated iron that brought low the homes of some five million families, and tore Eastern Visayas away, for seven days that felt like eternity, from the reckoning of the world and the local energy grid: leaving two provinces in total darkness, as the days turned into weeks that turned into months. Tacloban itself is a frozen photograph, a silent sentinel on the edge of Nightmare. Or a portent of things to come. The city has changed beyond recognition, at least physically, yet something beneath its surface-facade seems unchanged, almost permanent. Its economic life, the social conditions of its people, the rigid divisions of class and geography that determine who lives and who dies – none of this has been altered in any profound sense. Not even by the strongest typhoon to make land-fall in recorded history. I’d come on this journey with Balsa, an alliance of people’s organisations, churches, progressive media outfits and individual volunteers from across the country. This was its third or fourth major deployment in Eastern Visayas, a Caravan bringing aid and relief to communities worst affected by supertyphoon Yolanda (int’l. Haiyan) that tore Tacloban apart last November. 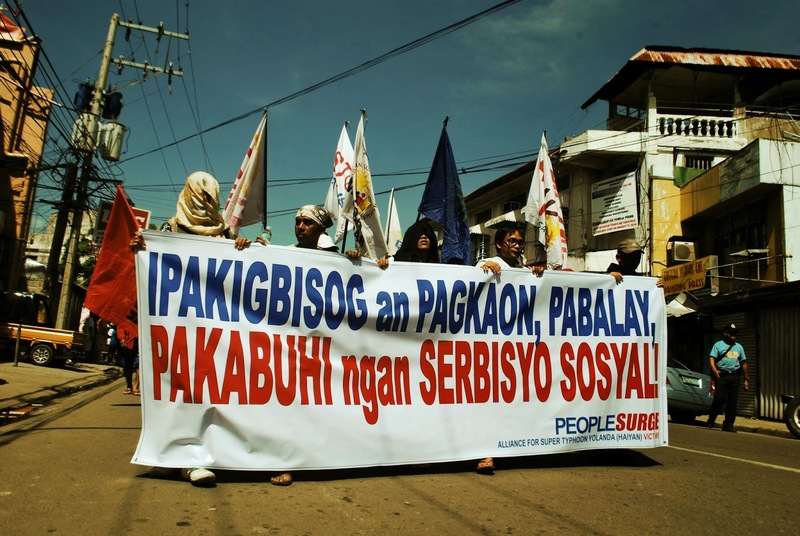 Balsa has been doing so for close to a decade now, responding to nearly every major natural disaster to hit the country with a unique combination of grassroots mobilization and long-term, community-led rehabilitation efforts. Despite its limited resources, Balsa has banked on the power of collective action to match or even exceed in scope the well-funded projects of some of the best aid agencies in the world. Encouraging the full participation of people directly affected by tragedy has ensured its efforts are deeply rooted with their needs on the ground. In Leyte, Balsa came not with an elite corps of engineers or disaster experts bearing blueprints from on high, but with community organizers, religious missionaries, teachers, volunteer scientists and medics – “people’s doctors” – even farmers from Luzon and Mindanao who’d saved seeds all year for just this purpose: to donate to fellow farmers in Visayas who’ve lost their crops. These were people with little to share individually but much to share at a collective level. It was with them that I saw clearest the difference between passive charity and an active, community-driven response to tragedy; the gap between what governments promise and what they deliver, and the need for action from ‘below’ amid damning neglect from above. It was a glimpse into human vulnerability that persists in the face of persistent poverty. It was also a portrait of human resilience and will to life that will come to define Tacloban (and the rest of the country) as the place where a people, levelled by countless storms, rose again. … Or rather, Day 2. It’s taken us 7-8 hours by bus to reach Sorsogon from Manila. It would take us another eight hours or so, more than half a day, to get past the port of Matnog, the main entry point to Leyte. So after hours on the road, my legs are killing me. My friends and I get off for breakfast and a brisk walk. At the port, vendors sell us hot pandesal, fried buns, sauteed veggies and tiny red native bananas that we eat with relish, before settling for a meal of tomatoes and fish roasted over an open charcoal fire. There’s little else to do but gorge ourselves, after all, and talk, as we wait for our turn at the barge. The early morning sun beats down on lush rice fields by the coast – it’s almost too warm, but in the faces of the people we meet is a cold tension, which is easy to miss until I approach one of them. At a bamboo stall next to our bus, a woman shelling mussels eyes us first with trepidation, then sympathy, as she spots the truck behind our bus bearing relief goods for Tacloban. It would be a long wait, she says. An endless line of buses and trucks, some stamped in bold-faced letters, “Relief”, crawls its way past us. It was, of course, a lot worse right after Yolanda. For weeks, a glut of good intentions and aid from Luzon and abroad clogged up - for miles on end – the only major thoroughfare to Leyte. There was no other way to get to Tacloban unless you travelled by air (and even the airport was down for some time). It was a logistical nightmare. With no transit fleet of its own, even the government had to rent trucks, lorries and cargo ships from private contractors to get goods to people on the ground. In Matnog, it opened up a separate route for relief caravans in an attempt to cut traffic, but this actually slowed things down. Many of the trucks weren’t carrying relief at all. It was commercial freight, scrambling for a quick opening to drop off goods to sell in Visayas. This sort of thing has been happening more often since the calamity. In fact everything we passed en route here, from overpriced bunk beds, to rising fuel costs, to boiled eggs that cost Php 17-a-piece, to restroom visits at roadside bus stops that cost Php 5 for a pee (Php 10 for a shower; another Php 10 for something else) - seems an opportunity to squeeze the most out of the calamity’s aftermath. After a few more hours, our boat, the Penafrancia, finally arrives. Boys as young as four climb twelve feet above the deck, diving gracefully into the cerulean blue sea to catch coins tossed by tourists with uncanny accuracy. We get on the barge and set sail for the Port of Allen. From there, we’d take another bus ride to Tacloban city, arriving there by midnight. Crossing the narrow channel between Samar and Leyte, San Juanico Bridge is cloaked in darkness, with only the lights from our bus guiding our way. Even in Tacloban city proper, rotating black-outs are a fact of life and dozens of public hospitals, schools and thousands of homes still depend on diesel generators for electricity at night, months after Yolanda. Despite this, government reports insist electricity has been restored in at least 60% of affected areas. A boy, around 8, shifts his gaze from the aid trucks outside to the camera I have in my hands. We’re by the window of the school gym at Eastern Visayas State University (EVSU), where I strain to find a scene, any scene, to latch on as I adjust my lens to just the right shutter speed. The early morning sky filters through the gym awning as we peer over the balcony at the courtyard. I soon find my scene. Below us, the first few hundred people gather for what would quickly grow into one of the largest demonstrations I’ve ever been a part of: a “People’s Surge”, including at least 12,000 marchers – young and old; families, farmers and fisherfolk from at least two dozen towns and rural barrios from across Samar and Leyte. They’d come for aid and relief, but above all for solidarity and a collective sharing of grievances, in protest against the government’s scant relief efforts post-Yolanda. For two days in this school auditorium with a portion of the roof still missing, there had been singing and story-telling and shared meals of canned sardines and rice wrapped in palm leaves, puson-style. This is what the boy’s family had come here for, assuming he still had one. The boy’s otherwise stoic face contrasts deeply with his eyes, which have perhaps seen too much, far more than his youth deserved. He looks straight into the lens of my camera, and not without some guilt, I snap a shot. He doesn’t smile. Pity or shame tugs at me: was I taking advantage of these people? These “victims” of what is surely the worst natural calamity the country has faced in a century? What if the boy had lost a sibling in the storm? A cousin? A parent? His whole family? It was a dilemma I would struggle with throughout my trip. I’d been commissioned as a photographer for the alternative media outfit, Kodao Productions, and I had no clue where to begin. I never managed to get the boy’s name, or the names of some of the others I would meet along the way. It felt rude, somehow, to intrude on their grief, though it was this same grief that prompted many of them to tell their stories, in minute-long chats that often drifted into night-long conversations. Maybe I was being melodramatic. At any rate, the simple fact of having survived Yolanda has brought people together, making all such social formalities irrelevant. I stop for coffee or a boiled egg at a road-side stall, and random strangers, spotting my press pass, would break into instant conversation, first in Waray-waray or Bisaya, then in Tagalog, once they learn I’m from Manila. A volunteer sounds the call for breakfast and the boy rushes past me. I exit the classroom we were in, and make my way through the crowded corridors - dark, dank, and in some places filled up to the ceiling with balikbayan boxes, long since been emptied of used clothes, canned goods and medical supplies. In the next building is the gym we’d slept in the night before, and here too hundreds of people lay crammed on the upper benches or shuffle to and fro the courtyard below. Elderly couples sip coffee, their grandchildren play basketball; one mother nurses her daughter, only days-old. A nun thumbs the beads of her rosary. All are waiting for their cue for the march to begin. By the university entrance is a blue tent, put up there by the doctors I arrived here with, from Samahang Operasyong Sagip and Health Alliance for Democracy. For a couple of days now they’ve giving free check-ups and medicines to a long line of people that now stretches past the gate to the next block, probably more than half a kilometre away. Many of the patients – one man crippled from the waist down, one woman blinded by cataracts– are joining the march. Renato Reyes of Bagong Alyansang Makabayan sounds the call. The march begins. The sun approaches noon and beats down hard on groups of protesters that converge in an intersection just past the university gate. It’s stifling. For most of the year, Tacloban city is one of the hottest parts of the country, regularly making it to the top of Kuya Kim’s temperature charts. Even after Yolanda. I zoom in. On the faces of the protesters is a flood of emotions, from suspicion to curiosity to excitement. On my own face is sweat, lots of it, pouring down in steady streams. Dust from thousands of marching feet form a cloud that rises above us and descends on the city, adding to the surreal scene. I knew there’d be a lot of people, but not this many. How many were we? A thousand? 8,000? 12,000? This was a surge. A surge of humanity on the edge of despair; a surge of relief in a desert flooded by a supertyphoon, a wave of well-meaning if short-lived aid, and months of government neglect. Each one in turn. I stand on tip-toe. There seems no end to the march. I take my first few, tentative shots. Many think I’m from the media, and break into hasty, shy smiles. Others doubt my motives. Soldiers, government officials or policemen in civilian clothes have been known to take photos of the scattered protests which have been taking place here with increasing regularity. The distrust was understandable: Eastern Visayas had long been the playground of Jovito Palparan, a general held responsible for commanding the torture and arrest of hundreds of activists, and for a suite of other human rights violations, in the early years of the former Arroyo administration. It was during this period that sections of the military turned into a de facto mercenary defence force for hacienda owners, commercial plantations, and large-scale mines that were pit against communist rebels. When hundreds of soldiers arrived in Leyte in the weeks following Yolanda – in fact, they arrived before government relief, to ensure security by cracking down on “looters” – they arrived, bringing back memories of fear, dispossession and landlessness that have made their mark on a region that is one of the poorest in the country. In the crowd something catches my eye. Among the marchers is a woman, in front of me, ambling slowly under the noon-day sun. She’s clutching her son’s arm. A small towel, stained with the sweat and grime of work on the fields, is the only protection the two have from the glare of the sun. The woman, Teresa, is well into her eighties and has lost sight in both eyes. She was the same woman we’d given a medical check-up this morning. Her middle-aged son is a fisherman, like many of the marchers – farmers and fisher-folk from rural villages across Leyte and Samar. Some had come from as far away as Luzon or Mindanao, just to march, donate seeds to fellow farmers, or help out with relief efforts. Mother and son inch forward with the marchers. Eventually I lose sight of them, with people cramming the road from end to end. We turn a corner and spot Gaisano grocery store, the main target of ‘looting’ binges in the days after the storm. Few of the looters, of course, were the ‘professional criminals’ commonly portrayed by the cops. The victims of the Manila-based media’s smear campaign were in reality families just scrambling to survive (among their ranks: the wife of the mayor, who managed to snag a pair of jeans from a looted department store). We cross a few more blocs and reach a small clearing by the coast. A small stage in the middle of the road – built with a few crates and an old pick-up truck - rises above a few market stalls. The first thing that catches my attention are the streamers, banners and placards. They’re everywhere. Ipadayonan Relief tubtob kina hanglan sa mga Biktima! Speed up relief efforts – aid to the victims! Ipakigbisog an Pagkaon, Pabalay, Pakabuhi ngan Serbisyo Sosyal! Fight for the Right to Food, Housing, Jobs and Social Services! NO-BUILD ZONE: Kontra-mamamayan, Land-grabbing! The government has prevented thousands of displaced families from rebuilding on lands they were originally on, claiming they’re far too dangerous for residential occupation. The catch: despite the alleged risks, many of these neighbourhoods are on public land bought up by private real-estate developers a few years ago. The survivors will have to be relocated to temporary bunk-houses built out of flimsy plywood and corrugated iron, long since criticised by Architect Felinio Palafox and the United Nations for failing to meet international standards for basic safety. Then I hear the voices. Each one – from farmers, community organisers, a student who lost her father in the storm - builds up to a poignant crescendo. Each one speaks of promised aid from the government that simply would not arrive in time, if it would arrive at all. Each one speaks of death, destruction and loss, but also of hope, resilience and rebuilding, stressing clearly the difference between victim and survivor. We spend another night at the University of the Philippines-Tacloban, before making our way through the coastal suburbs of Tacloban to the municipality of Alangalang, further inland. Our rented jeepney drives us through endless fields of rice: many only now throwing up the first tentative shoots of new life after months of. Nearly all the coconut trees that pass us by face East, as though bowing, prostrate, before a distant Mecca. After a brief stop-over at Palo, our caravan reaches Sitio Bigaa. a small cluster of homes on the outskirts of Barangay Langit, Alang-alang. We manage to hand over relief goods – clothes, food, medicines, cooking utensils, construction materials - to some two hundred families from Bigaa and neighbouring barangays, but on the way out, our aid truck gets stuck in a mud pit. Jerry, a local kagawad overseeing local relief operations, rushes to my side. We watch helplessly as more than a dozen villagers push the truck, unloading and reloading goods to lighten the load. The engine shifts to high gear to no avail. It takes us another two hours of heaving and hauling to shake it free. It reminds Jerry of the days after Yolanda, but this was a minor trouble compared to the horrors they’d suffered in its aftermath. At the time, roads were blocked and helicopters would fly overhead, as crates of relief parachuted down to a desperately hungry crowd, floating past the traumatized faces of people scrambling for crumbs. Still, Jerry considers himself lucky. He and most of his relatives escaped the storm relatively unscathed, apart from a few scratches here and there – and a home completely destroyed. While his family huddled in their tiny bathroom, a single, strong gust of wind tore off their roof and sent it flying to the next barangay. They waited for days before the first signs of contact arrived from Tacloban city. They ate wet palay, inedible under most circumstances, picking through the remains of their crops to survive. Then the days stretched into weeks, and relief goods came pouring in from people in Manila and around the world eager to reach out… but today aid has slowed down to a trickle, even in the city proper. The World Food Programme still distributes about a sack of rice per family each week (around two kilos or more for every child) - and a handful of charities still visit them on occasion - but aid from the government itself has been sorely lacking. A few weeks ago, representatives from the Department of Social Welfare and Development arrived in Bigaa, asking hundreds of families to move to temporary bunkhouses that are as distant from their livelihoods as they are unsafe. The plywood shacks on offer have sagging floors and flood after barely half an hour of rain. And rain has been pouring down constantly since Yolanda, like aftershocks from a big quake. Jerry and his family, among hundreds of others, rejected the offer. People would rather build their own homes near lands they have cultivated for decades. Give them the resources needed to rebuild, he says, and communities will recover. What people need here more than ever is long-term support, and above all cash, jobs and tools for reconstruction. Bigaa suffered fewer casualties, he tells me, than those in communities along the coast. Yolanda’s impact on local agriculture, however, has been devastating, wiping out vast tracts of coconut groves and rice fields literally overnight. This has been especially difficult for the majority of small farmers who don’t own the lands they till. Already in debt before the storm, many have taken on even more loans to rebuild their homes and replant their fields. In Carigara, the next town we visit, Edwardo Bastol and Melecio Llagas, tell me a similar story. Melecio is Edwardo’s uncle, pushing into his late fifties. Both of their homes were levelled by Yolanda, which saw a whole river redirected from East to West, flooding hundreds of acres of crops. When I visit them in their half-built home near Carigara elementary school (its roof still plastered with donated UN tarpaulins), Melecio is balancing himself on a single wooden plank, hammering away and eager to share their tale. Construction materials promised them had not arrived in time. In fact they received nothing in any kind of aid, apart from food. Barangay officials assured them there was no need. They had already begun to rebuild their home, after all, and thousands were in. There’s the catch. Edwardo has indeed managed to carve out a small but sturdy cement shack for his wife, two children, and his uncle who has since moved in with him – but only after taking out a hefty loan from his employer, a local vulcanizing shop owner. Without it, it would have been impossible to rebuild. Thousands like Edwardo have dug themselves deeper in debt as a result. Food, seeds, electricity, fuel, clothes, school supplies for their children, yero - corrugated iron roofs - are expensive. Post-disaster inflation, brought on partly by the difficulty of shipping goods to Leyte and the lack of proper public subsidies, has sent prices soaring. I arrive at a small grove a few blocks away, hidden by coco palms. I look around me, and note in passing the austere, almost deceitful, beauty of the place, perhaps concealing more than it reveals. A mountain on the other side, after all, used to be covered entirely with coconut trees and green shrubs, locals tell us. Now green is the exception, appearing only in isolated patches between emptied-out fields slicked in mud after the storm. I stumble on a ruined shack. Tattered curtains are draped on a few walls still standing. Bits and pieces of chicken wire lay scattered about. At first I mistake it for a chicken coop, then realise it’s someone’s home – or used to be. Torn clothes, some still damp, lay, as if to dry, on a bamboo pole. Sunlight pours in from the emptied-out frame of the roof, like a wooden skeleton. The place looks abandoned, so I turn to leave, before a woman approaches me from a corner, shyly, cradling a boy in her arms. Estelita Garantinao is in her sixties and lives alone, with her husband and three-year-old grandson. Like most other families, the child’s parents have moved to Manila, hoping to send money back home. Her husband is paralysed from the waist down. He would have died in the storm had she not pushed him away in time as the wind heaved a tree from its roots – a kind of pillar in the middle of their nipa hut that had been its foundation – and hurled it down in front of them. It was a caimito tree that had weathered countless storms for over twenty years – until Yolanda. It crushed everything from their bedroom to their tiny kitchen. Estelita has no money to spare to rebuild or even clean up. She washes clothes for her neighbours, and earns just enough for her family to eat. She’s too weak now to rebuild from scratch, all by herself. So three months after the storm, their tiny home is in shambles. They live in a temporary shack, even smaller than the first, built by her brother next to the ruins. Estelita stops talking. I realise she opened up to me before she even got my name, before I even got to say a few words in reply. I tell her I’m from the relief caravan and she thanks us for our help. At this I feel more shame than pride. Had I really helped? Had I done any more than report on their grief? What did we from Manila really know about their plight? And did I interview the others, she asks? The boy who lost his whole family in the storm; the pregnant young mother, her husband a jeepney barker in Manila? There were stories. Hundreds of them. But there was simply no time to hear them all. We would leave for Palo the next morning. It was like a scene from Titanic. Walls of water rush in as floors give way to a seething ocean. People clamber onto their roofs, and grab anything they can find as the tide surges forth, enveloping everything in its path. Class D passengers, women and children included, drown in the cabins below, while the aristocrats of the upper decks escape unscathed. The homes of the poor are wiped out. Schools are forced shut. The mansions are left standing, empty for now, their distant occupants safe in Manila. Relief goods bought and paid for, or stolen outright by local officials who have divided the spoils between themselves and their voters. A ravaged local economy, leaving one of the poorest and most unequal parts of the country with a population even more vulnerable, post-Yolanda. Rehabilitation efforts being given over to Big Business, courtesy of Panfilo Lacson, the region’s “rehab czar”, who has officially declared his support for a private-sector led initiative. Already, real estate, construction and commercial investors that run the gamut from Consunji to Ayala to Pangilinan have sunk their teeth into juicy contracts included in the government’s rebuilding and rehousing programmes. Homes for the survivors of Yolanda will be built by the builders of Manila condominiums, at nearly the same price. Thousands will never be able to afford them. Tens of thousands more will remain homeless, landless, and jobless in a region that will surely take more than a decade to recover even half of what it has lost, in money and in human life. But some scenes of recovery are visible. Communities are picking themselves up from the ruins, mostly thanks to people’s own efforts in the absence of government support. Palo regional hospital is being rebuilt, courtesy of the South Korean military. Crime rates are fairly low, despite sensationalised reports of “mass looting” in the days after Yolanda. Donations are trickling in, thanks to scattered charity drives that can only do so much without a more comprehensive, pro-active role in the rehab efforts by the state. And the corpses are gone. Many, of course, are still missing; others were buried after more than a month in an advanced state of decay. As of late January, new bodies are being discovered, at a rate of one per day, calling into question the government’s modest estimates of more than 6,700 dead. In Palo, roofless buildings are perhaps the second most common sight one sees across the town. The first most common? Smiling children. From day one, children would huddle around me and my camera – something I would get used to after a week in Leyte. One of them, in fact, was on the bus on my way back to Manila, and even asked me to take a picture of us together. Indeed, raising the camera to my face to take a shot seemed a cue for someone to smile. And smile people did, with broad grins that stretched up to the wrinkles of their eyes. What made them smile wasn’t innocence. They had all seen too much for that. It would be another 24-hour journey before I could finally reach home. In Eastern Visayas, some 15 million people have a much longer journey ahead of them. It’s difficult for the casual observer to connect any of the horrors its people have faced with the beaming faces you meet in this society of contradictions. It’s easy to be misled. Sometimes suffering can be too deeply etched on a person’s face that the sheer weight of their troubles erases all external signs of sorrow or despair, because succumbing to despair is useless when your life is at stake, and you have a family of five to care for. Whether or not this is a sign of genuine happiness or isolated glimpses of joy – temporary breaks in an otherwise painful existence – is another matter. What comes out as resilience can be hidden sorrow or anger, long repressed. To the greatest tragedies, there are only ever two ways humanity can respond.